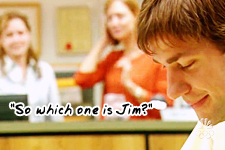 Final Score: +5, There wasn’t much interaction between Jim and Pam in this round, but the “Which one is Jim?” moment was extremely promising. Pam’s mom whispered the question like it was a fun secret between her and Pam, and Pam reacted like a teenager with a crush. It’s clear Pam has talked about Jim with her mom, and not just in a co-worker capacity. I love when her mom asks which one is Jim, I feel like Pam has a crush on Jim at this point but might not realize it, but her mom does and that’s why she asks. Thanks for your comment! And I never actually thought of it that way, but makes perfect sense, Mom would certainly know her daughter’s behavior when she’s crushin’. Such a great scene!